It’s not really a shame when you missed these albums when they were originally released in 1990/92/93. Even though the original label (Barooni) was located in my hometown, I did not notice these releases until they were re-released on Mille Plateaux a few years later. 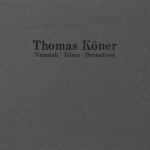 With following album releases, Thomas Köner’s immersive drones found wider attention, and gained more and more recognistion. 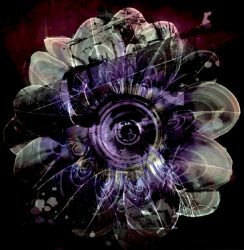 Albums like Kaamos, Daikan, Unerforschtes Gebiet, Nuuk and, more recently, La Barca) firmly established Köner’s reputation as the absolute master of immersive deep dronescapes. And thus the interest in his back catalogue also grew. 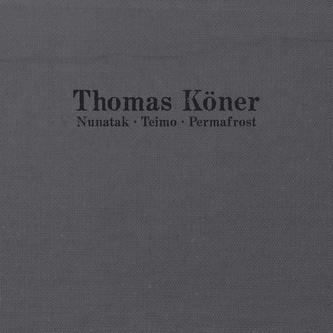 Recently, Type Records have re-released Köner’s first three albums on vinyl. For those that prefer the CD format, a 3-CD version of these remastered albums is now also available. So don’t let them pass you by this time: these albums are definitely classics of electronic and drone music! Nunatak, Teimo and Permafrost are presented in a foldout digipack, with only black and white photograpy of arctic images (Köner’s music is often referred to as “arctic sounds”). 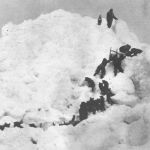 Unfortunately, it lacks any background information about the recording process of these albums. For his first albums, Köner used all kinds gong sounds, recorded in different conditions and heavily processed. The result is a warm, natural sounding (yet somewhat metallic and alienating ) sound. The first album of the set, Nunatak (originally called Nunatak Gongamur) is Köner’s debut, and presents an artist exploring new art-forms, searching and experimenting. On the next two albums Köner has obviously established his direction and continues to explore the (previously unexplored) territories of his sound. No other artist that I know is able to create such deep and deserted sound environments, where time no longer seems to be a dimension (although Eliane Radigue’s Trilogie de la Mort may be one of the exceptions). Though he always finds new angles to create his music (Daikan, for instance was created using a Japanese large drum; Unerforschtes Gebiet records the grains of dust on movie celluloid), Thomas Köner’s unique sound can easily be recognized. A Master of Drone, indeed. Listening to Nunatak, Teimo and Permafrost evokes the same sort of feelings as watching the classic Solaris movie (1972). I guess from now on we could refer to Thomas Köner as “the Andrej Tarkovski of electronic music”. Well said Peter !….great albums, even Eno was knocked out with Permafrost.